Details of a new member of the Motorola Droid family have been unearthed confirming that the device will arrive sporting an 8-megapixel camera, 4.3-inch display and will function as a 4G LTE hotspot. Specs of the device, which hasn’t been given a formal unveiling as yet, are freely available on Motorola’s official website for all to see. That said, the spec list on the page very closely matches those of the Motorola Droid Razr M, so they might well change when the device is properly introduced if Motorola has simply been using them as a placeholder. We’ve asked the company for clarification and will let you know if we get confirmation either way. Other key features listed include a dual-core 1.5GHz processor, the Android Jelly Bean (4.1) operating system, HD video and stills capture up to 1080p but it sadly only has a 0.3-megapixel front-facing camera. On board storage is capped at 8GB, and only 4.5GB of that is usable, but the phone will play nicely with microSD cards up to 32GB. The handset can also be used as a 3G or 4G mobile hotspot, providing other devices with data connectivity via WiFi but unfortunately that 4.3-inch Super AMOLED Advanced display only offers a resolution of 540 x 960 pixels. Overall, the handset weighs in at 126 grams (making it the same weight as a Lumia 710) and measures 60.9mm x 122.5mm x 8.3mm thick. 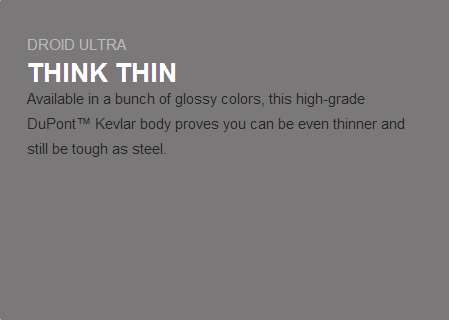 Although there are no pictures of the device as yet, the page also confirms that the Droid Ultra will come with an aluminium frame (with a “diamond cut spin on the black model” although there will be “a bunch of glossy colors”) and will be made up of Dupont Kevlar fiber and Corning Gorilla Glass, which might add a touch of class to an otherwise forgettable sounding device. Judging from the distinctly mid-range specs, the Droid Ultra isn’t likely to be the handset to lift it out of the sales doldrums it’s currently languishing in. However, this isn’t too surprising given Google (now owner of Motorola’s mobile business) has said it has a pipeline of products to build before it can start delivering anything too special. Recent rumors have suggested that Google may be working on its own take on handsets like the Samsung Galaxy S4 and the iPhone called the X Phone, but the search giant is yet to go on the record and confirm it.